-Roll down your windows. THIS IS A MUST AND ABSOLUTE FIRST THING YOU SHOULD DO!!! THIS GOES FOR THE BACK DOORS AS WELL!!! 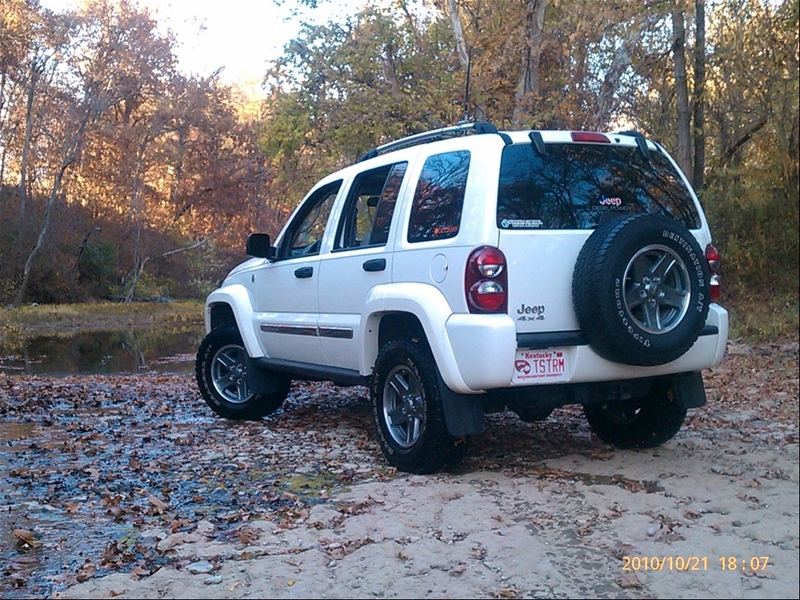 Here are pictures to help…DO NOT TAKE THE TOP NUT OFF TIL YOU’RE READY!!!! Once the nuts are loose, unscrew all the nuts except the Top Hinge Top Nut. IF YOU’RE DOING THIS BY YOURSELF: Take a chair (kitchen chair) and slide it under the door. So if the door decides to come off while you’re working on the second to last nut or the last nut, it will catch it somewhat. Which will prevent damage to your feet and the KJ door. While (trying) to hold the door level, place your left arm through the window and have the door kind of sitting on your shoulder while you screw the last nut off. Door should pull right off…Place the door somewhere in a garage or somewhere safe. 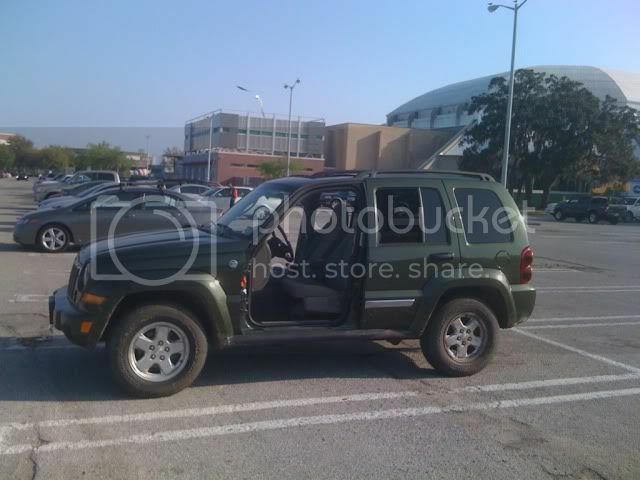 ENJOY DRIVING WITH YOUR JEEP LIBERTY DOORS OFF!!!! Last edited by blackwidowkj06 on Fri Jun 08, 2012 4:51 pm, edited 2 times in total. I've never taken the back doors off but maybe I will someday. I just really wish I didn't lose the radio sound with the front doors off. Do you happen to know how to fix this problem? do you have alignment issues with the doors when you put them back on? Just make sure there are no nit-picky state troopers around. They'll write you up for not having mirrors. I've seen some XJ guys take all four doors off AND take them on twisty trails like that. Not sure if it causes them trouble or not. Since I lose all the sound I don't think that will work, but I will give it a try. I actually tried to make side mirrors out of cj mirrors but I couldn't get them at an angle I liked. I'm still working on that part. Unless you offroad/flex with doors off OR do a nut/bolt/washer set-up instead of using the hinge pins...then no there shouldn't be any alignment issues. I don't even think off road driving would mess up the door alignment. No doors and xjs are all over in the summer and wheeled hard. Also, tried the radio tuning and it did not work. Trying to figure out why the sound is cut out still. For one, I'm NOT going to even try offroading or flexing without my doors. I should say "Offroading or Flexing without doors will increase the chance of the Uni-Body twisting and/or door alignment." If you do the nut/bolt/washer conversion, where you swap the hinge pin for those 3 things; I KNOW that will mess up door alignment. And I'll try to figure out the sound thing. Doubt there is anything you can do. Tube doors will hide that. Pictures are all down. Does anyone have instructions for the KK (is it the same)? I'm pretty sure it would be the same. I will get the pictures back up by tomorrow at the latest. Updated this thread and put the pictures back up. Doors are not part of the structure of the vehicle, and in addition, offer very little protection in the event of a side impact collision. That is what the A, B, C, and D pillars are for. Great write-up though, I think I wanna try it one day just to do it. Funny how it takes 15 minutes to take the doors off, when it takes less than a minute to do it at the factory. Hey Marlon you'll be the first KK to do it. At the factory, you have multi-million dollar robots to help you get the doors off. All I have is my hands, my tools and muscle to take them off. Thank you for the complement on this thread. I tried to be detailed as possible so it would be easy to do this. I would need to make something like we use at work. As ArcherAce said in the other thread, the weight of the door hanging improperly will throw off the alignment. Now THAT is likely the reason for misaligned doors, at least in a KJ/KK. Whatever order is used at the factory is likely best. I will have to check it out someday.